The first domesticated companion animal, the dog, is currently represented by over 190 unique breeds. Across these numerous breeds, dogs have exceptional variation in lifespan (inversely correlated with body size), presenting an opportunity to discover longevity-determining traits. We performed a genome-wide association study on 4169 canines representing 110 breeds and identified novel candidate regulators of longevity. Interestingly, known functions within the identified genes included control of coat phenotypes such as hair length, as well as mitochondrial properties, suggesting that thermoregulation and mitochondrial bioenergetics play a role in lifespan variation. Using primary dermal fibroblasts, we investigated mitochondrial properties of short-lived (large) and long-lived (small) dog breeds. We found that cells from long-lived breeds have more uncoupled mitochondria, less electron escape, greater respiration, and capacity for respiration. Moreover, our data suggest that long-lived breeds have higher rates of catabolism and β-oxidation, likely to meet elevated respiration and electron demand of their uncoupled mitochondria. Conversely, cells of short-lived (large) breeds may accumulate amino acids and fatty acid derivatives, which are likely used for biosynthesis and growth. We hypothesize that the uncoupled metabolic profile of long-lived breeds likely stems from their smaller size, reduced volume-to-surface area ratio, and therefore a greater need for thermogenesis. The uncoupled energetics of long-lived breeds lowers reactive oxygen species levels, promotes cellular stress tolerance, and may even prevent stiffening of the actin cytoskeleton. We propose that these cellular characteristics delay tissue dysfunction, disease, and death in long-lived dog breeds, contributing to canine aging diversity. The online version of this article ( https://doi.org/10.1007/s11357-019-00062-6) contains supplementary material, which is available to authorized users. J.W.N and J.D.Y thank Siri who is a good dog (12 out of 10). We also thank the NVIDIA Corporation for their donation of the Titan Xp GPU used in this work. Lastly, we thank the Cornell Veterinary Bank for primary canine fibroblast donations, as well as William Kohler and Melissa Han of the Miller lab for fibroblast preparations. Conceptualization, J.W.N. and S.L. Formal analysis, J.W.N. Investigation, J.W.N., M.P., T.M.R., S.V.T., A.B.F., J.D.Y., T.K.Y., D.V., M.W., F.K.H., and O.R.I. Writing—original draft—J.W.N. Writing—review and editing—J.W.N., T.M.R., J.D.Y., T.K.Y., I.S., M.D.H., and S.L. Supervision, S.L. Funding acquisition, J.W.N. and S.L. S.L. and J.W.N. were in part supported by a grant from the American Federation for Aging Research (AFAR, grant no. 2015-030). S.L. received seed grant funding from the Cornell University Center for Vertebrate Genomics. J.W.N. 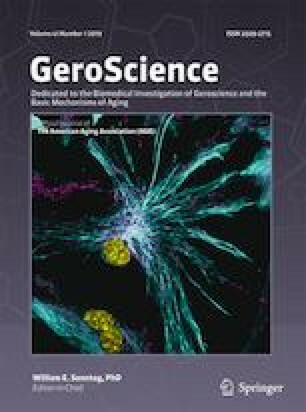 was supported by a Glenn/AFAR Scholarship for Research in the Biology of Aging. R.A.M was supported by the National Institute of Health grant U19-AG023122. I.S. group was supported by the National Science Foundation grant CMMI 1435655.